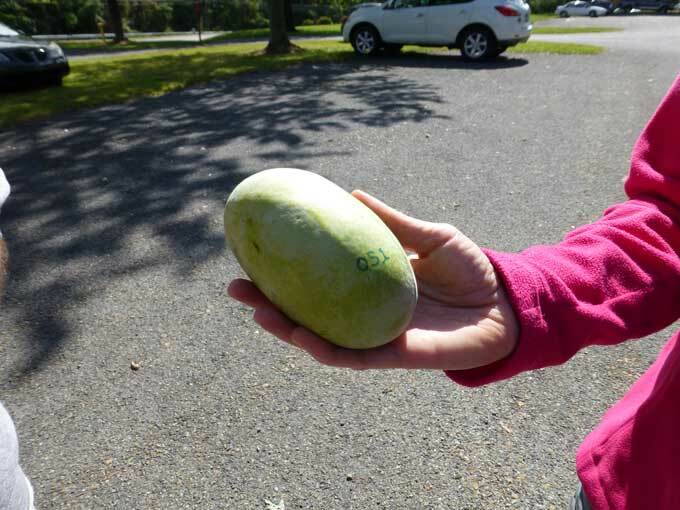 For Backyard Fruit Lovers Fall is an exciting time here in Central Pennsylvania with events such as the apple harvest, the Backyard Fruit Grower’s annual fruit tasting, and this past weekend’s Pawpaw tour all featured on the calendar. Ask most people about Pawpaws and you’ll get the same looks as though you had mentioned Jujube Trees because they are both relatively uncommon fruits, even among experienced gardeners. 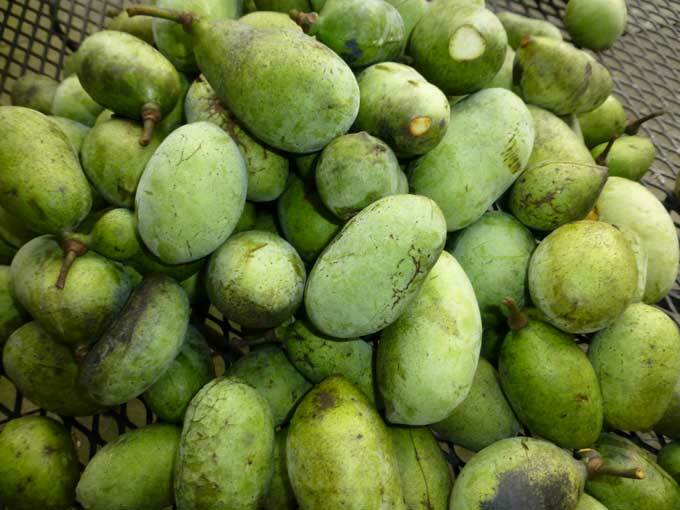 But unlike Jujubes, in this area Pawpaws grow wild and are easy to forage if you can locate an established stand of the trees. So What is a Pawpaw and What can You do with One? If you’re asking yourself “exactly what is a Pawpaw” then here is a link that a friend shared with me this week from an NPR story about this unusual fruit: Foraging for America’s Forgotten Fruit. And there is also a page on the BYFG website with Pawpaw information and resource links related to this native fruit tree. One of the best aspects of the Backyard Fruit Growers Organization is the opportunity to meet and learn from experienced local fruit growers like Les, a hardy kiwi expert, and Ted Weeden the club’s own authority on Pawpaws. A group of BYFG members gathered in Lancaster County, PA this past weekend to explore the interesting tastes and textures of both the wild and cultivated forms of Pawpaws. 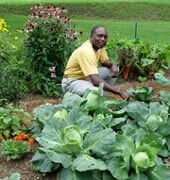 On Saturday Ted hosted a tour of his home orchard of cultivated and hybrid Pawpaws. Ted’s backyard is loaded with Pawpaw trees and he has quite a collection of assorted varieties of this uncommon fruit. Most cultivated varieties have been developed for their flavors and the sizes of the fruit, which grow much larger than the wild versions. 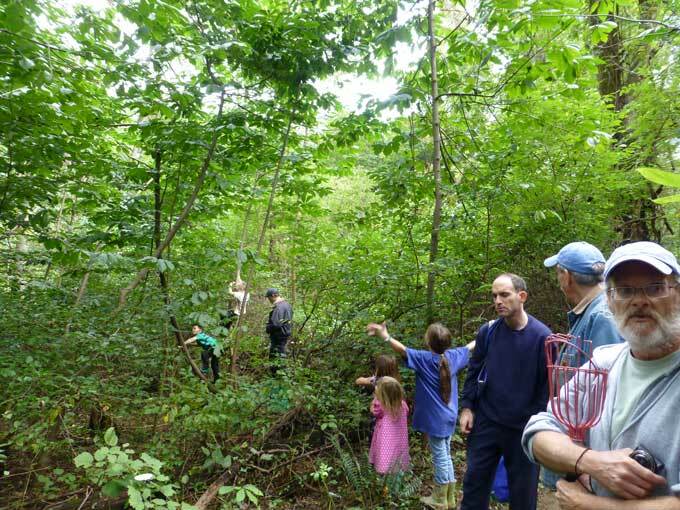 The following Sunday there was a BYFG group excursion along the Susquehanna River near the Holtwood area to forage for wild Pawpaws. It was a perfect day weather-wise and trees held a good number of fruits just waiting for us to shake them down to the ground. We all left with a nice harvest of tasty Pawpaws to take home and ripen. 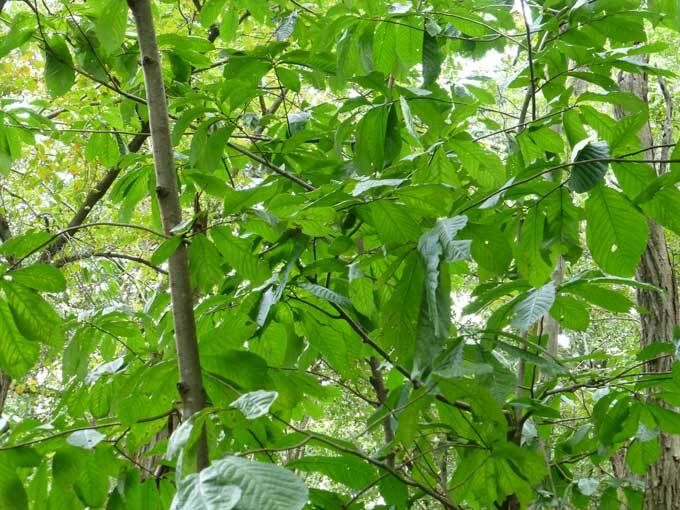 Above is a photo of the understory canopy of a group of Pawpaw trees, recognizable by their leaves as well as the bark of their trunks.Many of the trees in this grove also had a habit of leaning over rather than growing fully upright. The kids joined in on the excitement as they tried to climb the Pawpaw trees to reach the fruit. A much more effective way to harvest Pawpaws is to simply shake the trees until the more mature fruits drop off. A shot of a ripe Pawpaw ready to be eaten! You can see the custard-like texture of the fruit’s pulp which is very sweet and flavorful. 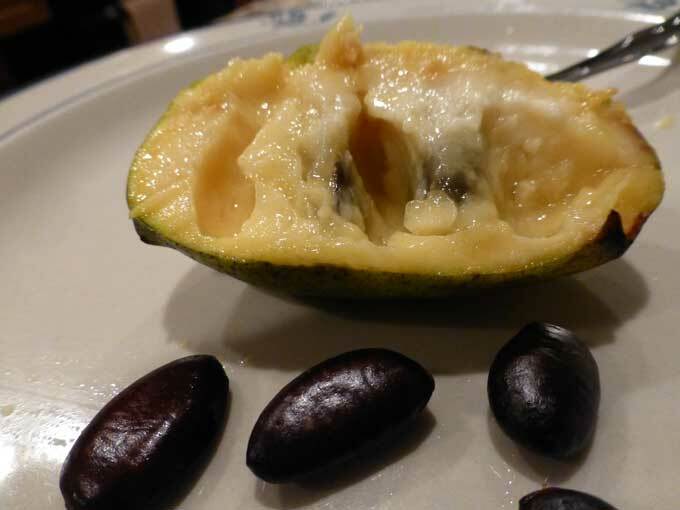 The Pawpaw seeds are large and can be saved for germination to raise new plants. 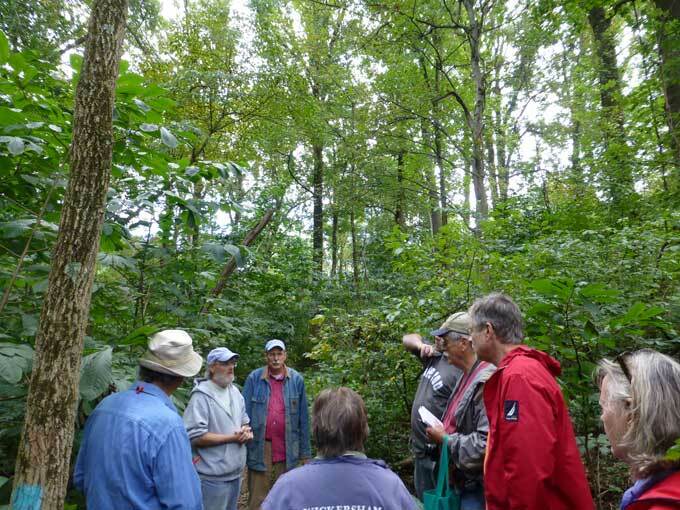 Here is part of the BYFG group gathered in the midst of a grove talking about Pawpaws and other delights of the forest. The Pawpaw trees tend to form groves or networks of trees as they spread through the forest via underground runners. My Pawpaw haul was sizeable but so were the scrapes and scratches I suffered as I went deep into the stand of trees in spite of patches of briers that blocked the way. I gathered enough fruit to share and take home with me. Here is a close-up of a cultivated hybrid Pawpaw that shows the large size and similarities in appearance to a mango, with which Pawpaws are sometimes compared. They are also likened to bananas and even remind me in some respects of persimmons. How Good are You at Identifying Tropical Fruits? Thanks for posting the pictures and information about paw paws. It was a lovely afternoon. You’re welcome Linda and it was great to get together at the Pawpaw tour. Rebecca, I would not be surprised to find Pawpaws growing wild in NC and I’m positive that they could be cultivated there with no problem. My father said his mom (my grandmother) used to pick them often. I’ve never tried them, but when he told me about that (years ago) I’ve always wanted to sample them. My father brought up paw paws while watching a singalong series from the Cedarmont Kids (with my daughter and me.) One of the songs was about a Pawpaw patch. Thanks for sharing that story Opal, the same Pawpaw song came up in the office when I brought some of the Pawpaws in to share with my co-workers.